The Cleveland Jobs with Justice Annual Spring Celebration is the time we take to celebrate our victories and recognize our activists who have been champions of workers and social justice throughout the Cleveland area over the past year. We are honored to announce our 2019 award winners: the Louis B. Stokes Award: Brian Poindexter, Ironworkers Local 17 and City Council at Large, Brookpark; the Smilnak – Rosen Award: Community Activist and Former Labor Leader, Anne Hill; and the Reverend Bob Strommen Award: Retired Teacher and Community Activist, Steve Holecko. We are excited to have Alex Bevan, first known as "The Skinny Little Boy" from Cleveland, Ohio providing the entertainment during the cocktail hour, which will begin at 5:00 pm. Alex will also be acting as our Master of Ceremonies for the evening. Alex is a proud member of the Cleveland Federation of Musicians Local 4. Our keynote speaker this year will be Rollie Dreussi, Executive Secretary, Northeast Ohio Newspaper Guild - CWA, Local 1, who will be talking about one of the local labor fights that has been ongoing over the last couple of years in Cleveland. We will also have a special message from U.S. Representative Marcy Kaptur - Ohio House District 9. 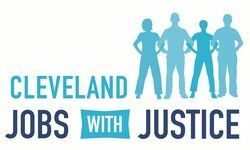 Cleveland Jobs with Justice has partnered with Give Lively to securely process your online donation. This transaction will appear on your credit card statement as "Cleveland Jobs with Justice". This transaction is subject to Give Lively's Terms and Privacy.